July 20, 2017 – Kuala Lumpur, Malaysia – Brewer Science is pleased to announce that the company was selected by ON Semiconductor to receive the prestigious Perfect Quality Award. 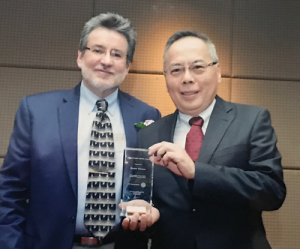 Dr. Andy Wong, Managing Director of Brewer Science Taiwan was presented the award by Mr. Keenan Evans, Senior Vice President Corporate Quality and Dr. Jeffrey Wincel, Chief Purchasing Officer and Vice President of Procurement, for ON Semiconductor at the 2017 Awards Dinner which was held on June 5 in Kuala Lumpur. Undergoing a quarterly quality evaluation, Brewer Science received a perfect score all four quarters in 2016 earning the annual award. The receipt of this award highlights the commitment that Brewer Science has to enabling the success of its customers. With more than 35 years of success, Brewer Science has been recognized globally for its expertise in advanced manufacturing, which has accelerated the timeline for product development. Brewer Science is a global technology leader in developing and manufacturing innovative materials and processes for the reliable fabrication of cutting-edge microdevices used in electronics such as tablet computers, smartphones, digital cameras, televisions, LED lighting and flexible technology products. In 1981, Brewer Science revolutionized lithography processes with its invention of ARC® materials. Today, Brewer Science continues to expand its technology portfolio to include products enabling advanced lithography, thin-wafer handling, 3D integration, and chemical and mechanical device protection, including products based on nanotechnology. With its headquarters in Rolla, Missouri, Brewer Science supports customers throughout the world with a service and distribution network in North America, Europe and Asia.